At the end of our relationship, I want you to smile and be happy with how your	project turned out. I like brainstorming with customers, and in most cases, this has worked out well. Several popular tiles here, such as the indigo ducks and the Carta Marina were the result of brainstorming with customers who wanted something that fit with their interests and lifestyle. I've created bespoke tiles for Gensler Architects in Chicago, the World Food Prize Foundation in Des Moines as well (see some installations). That said, I'm no longer taking on custom projects. Well, usually. As I sat down to write this, I was contacted about a project that is too seductive to pass up. I don't want to miss those. But usually, no. Still, if you are excited about it, I might be. If you're a designer who has a client who thinks they might want "Something Special" six or eight months down the road, and will I please spend a week doing mockups to discover what the client likes by the process of elimination, well no. But enthusiasm is contagious, so Contact me and ask for an invoice for a Consultation. I can usually tell you quickly if I can do something, or it may take a few days to find out. While this is a very Morris way to do business, when we are in tile season, I can't spend a week on a fishing expedition to hear "We've discussed it and we've decided to go in a different direction." We have to share the risk. Here's how that risk breaks down. How Much Would It Cost for ___? Fishing License (Consultation): $250. New fishing expeditions incur a consultation charge to see if there are indeed any fish. We will schedule a time to talk so I can find out about	your tile project, scope, colors, visions, and answer any questions you have. If we decide not to go forward, I will refund your consultation fee less 10% and the cost of mockups or sample tiles. 1. It's a minor change and we're done fishing and you can proceed to order tile. Your consultation fee will apply to your tile order, less any mockups or sample tiles. A fishing license is also sufficient for size changes or if you want tumbled tiles rather than ceramic. 3. It's not something I can do for you, or cannot do in a timely or cost-effective way, such as an exterior wall mural. In such cases, I'll give you recommendations of people who can help you get what you want. And I'll refund your consultation fee less $25. For entirely new projects, the next step is a Proof of	Concept to ensure we are not talking past each other about what we're doing. A Proof of Concept is $250 for single tiles and this comes out of your consultation fee. I charge $350-$500 for large tiles, panels and murals but maybe less and certainly not more than that. You will get a mockup or photo of what we're making for your approval. Once I have a mock up and made an initial	tile or two, I can give you an estimate for the completed project. That estimate will be in the form of a not-to-exceed amount, unless I you and I agree. I try to avoid slithering up to customers telling them how far off I was, so I usually just absorb the cost but sometimes I just can't. If this does happen, I'll suggest a way we can descope the project to stay within our agreed-upon budget. Contact me and tell me what you have in mind and ask for an invoice for a Consultation. If it's a minor change or modification, you don't need a Consultation and I'll tell you so. If we'll have an ongoing dialog, with approvals and mockups, you need a Consultation / fishing license for time we spend fishing. We can consult by phone, or email if international or it works better with your schedule. If we agree to continue, and it isn't a minor change, and arrange a mockup as Proof of Concept and/or send a sample tile. You don't need a fishing license to order a sample tile, just Contact me, tell me the tile you're interested in, and ask for a single tile invoice..
Next, I get your approval on the Proof of Concept. Or not. When we have agreed on a Proof of Concept and decided to proceed, I'll ask you about specifics like size, glaze, number of tiles, and send you a second invoice for a deposit, usually 50%. The very best way to choose your field tile is to take one of your actual tiles with you to the tile store. There is variation, even between runs, and this is the safest way. I can send a small sample off the day I start your tiles and you'll have it a week or two before you get your actual tiles. It is not custom work if you buy a sample tile and it arrives and you want it to be more red and I say no problem. It is custom work if you need to approve exactly how much more red is, or if you send me a knob, paint sample, field tile or other item. It's important to know that I cannot match colors exactly to paint samples or fabric. Sometimes I come close but it's always a happy surprise when it works out. If you have a field tile with a little or more color variation, often consisting of little flecks of color, the color will appear different depending on how far away you stand and the light in the room. There is natural variation between runs and even some slight variation within a run,so an exact match is close to impossible unless your tiles are mass manufactured in a temperature controlled environment, rather than hand made. Moreover, matching gets more difficult as time passes and the environmental conditions change, which means that a sample tile I sent you in August is going to be near impossible to duplicate in January, and I will find myself trying to color match my own tile. I understand that web colors vary from computer to computer and you may want to see a color before deciding. That's not a custom color, that's just a good reason to buy a sample tile. But... Fussing with colors is time-consuming and less fun than one would think. For both of these reasons, sometimes one more than the other, there is an extra charge per	color, ranging from $0 for general requests of "I'd like that yellow	flower to be just a little lighter" to $100 per color for more than one color change in a design. One sample tile with your requested color change comes with your Consultation. If you know the range of color you like, you can send me that and I'll do my best to get in that range. If we have to go back and forth, it's a new sample tile invoice every time. Have I talked you out of Color Matching yet? For ceramic, if the original base white shows, well, the thousands of colors of white may highlight differences between the original tile and the replacement, even if everything else goes well. Complementary colors are likely to give a better result than matching. In most cases, the minimum number of tiles is 15. I set a minimum number of tiles because there's a point where the time and set-up for an order gets out of proportion. If you are getting multiple patterns, and the color we finally agree upon is the same through, I'll waive this. 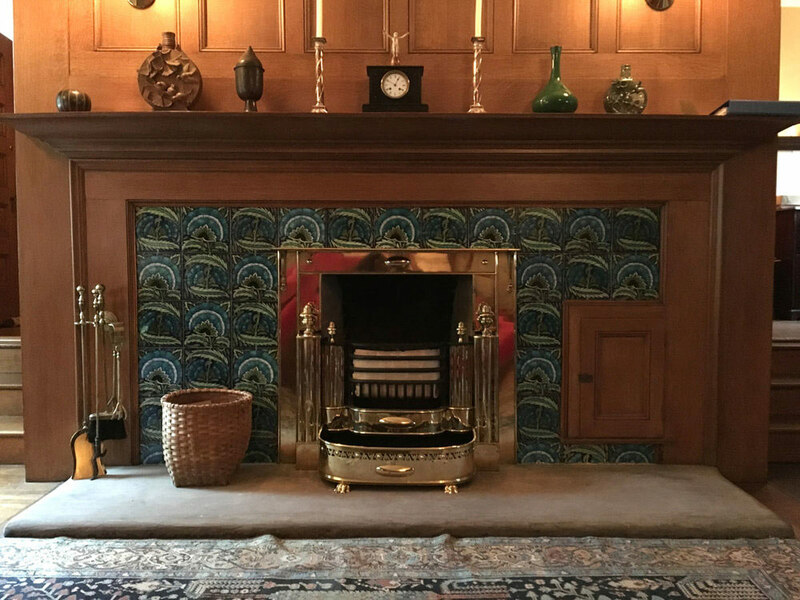 De Morgan Fireplace restored at Glessner House in Chicago, a place well worth visiting. Can you spot the replacement tile? Me, either. But there is one. William Tyre, the Executive Director and Curator of Glessner House, is also a PreRaphaelite aficionado. See his Briar Rose and Willow Bath. What is Glessner House, you ask? Matching existing tiles is problematic in other ways than color. Are my blanks the same thickness, with the same corners? Probably not. 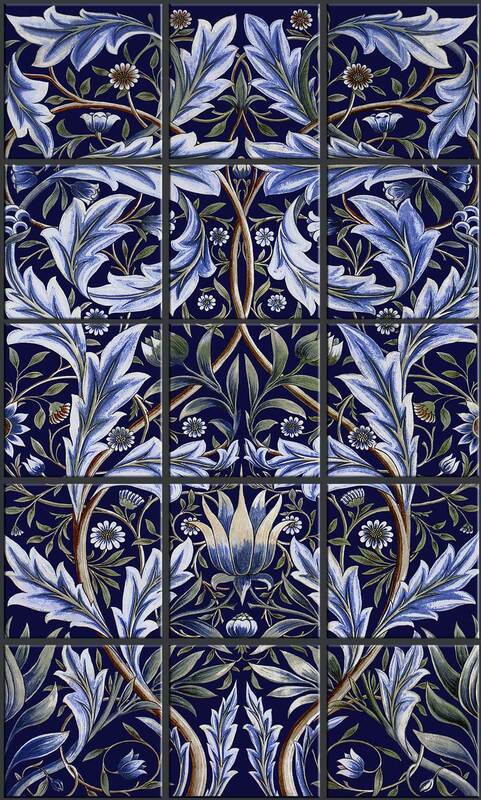 All Morris & Co. tiles, and all but the very late De Morgan tiles, were made from commerically available blanks. So are mine, and while the quality of blanks has improved, this won't be helpful if you are trying to replace a tile in an antique fireplace surround. Give these folks in the UK a try: Victorian Ceramics. I've referred several people to them and all but one were very happy with their work, and well, some projects are just pretty close to impossible. If you do, please let me know how it goes.